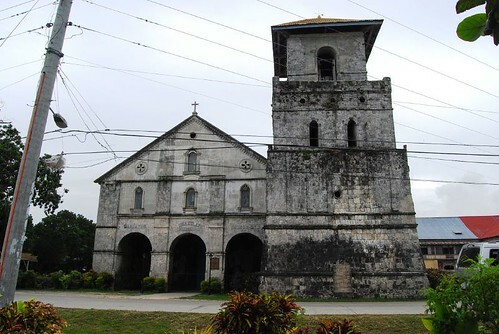 Ever since I was small and at every visit to Bohol, I pass by the Baclayon Church on the way to my Dad’s place in Guindulman or to my Mom’s at Mahayag, San Miguel. You would hardly miss the dark, imposing structure looming at the side of the road in the municipality of Baclayon. Yet, for all the years that I have traveled to Bohol from Mindanao where we lived, never had I the chance to see its interiors. At that early age, I took old churches for granted. They were all so drab looking and in my young mind, all the figures with flowing robes hidden inside rooms gave me the creeps. I slept at the Loboc Church, then the Loay Church, and lastly, at the Calape Church when we went and visit the brother-priest of my grandmother, Titi Joven Sanchez. It seems that in every few years, the priests are transferred and reassigned. At every visit to Bohol, my mom never misses a visit to Titi Joven, who is her best friend. Only recently was I able to visit this famous church and my mind set was different. I have grown, and I have now appreciation for art, artifacts and their value. 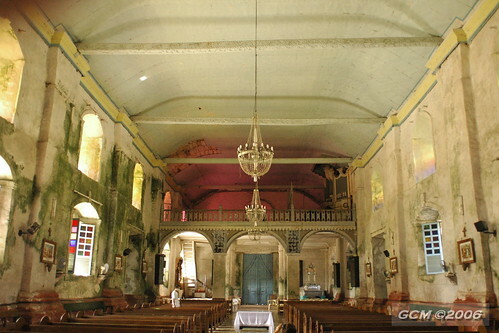 So the chance to visit Baclayon Church was a go-go and a cause for excitement. Thanks to the visit of Sr. Redempta Omblero of the Missionary Sisters of Triumph of the Cross who is a dear friend of the family and at an invitation of her friend, Baby Sagario, to visit her at Baclayon, the trip was scheduled. 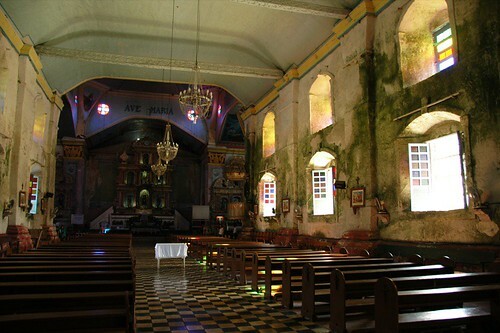 For those who have never heard of the Baclayon Church, it is the oldest church in Bohol and is the oldest in the Philippines although some say that it is second only to the San Agustin Church in Manila. The church is made of coral stones hauled from the sea which is only a few meters away from it. It was said that 200 slaves were forced by the Spaniards to build this huge edifice and millions of egg whites were used with lime to cement all the stones together. Unfortunately, I was not able to bring a camera with me so I cannot give you pictures of the church during our visit. Allow me to describe the place as best as I could instead. Lying alongside the road is the bell tower made of coral stones with a rooftop. Although it adjoins the main façade of the church it is a separate edifice and does not cover the front facade. One can clearly see the front façade of the church with its three arches with huge wooden doors. Coming directly from the brightly lit outside world and going thru the huge door at the center which was estimated to be 20 feet tall and very wide, the church interiors looks dull, dark and gloomy. It was the first impression I got although that changed after my eyes adjusted to the interior light and slowly noticed the sunlight streaming from the colored stained glass at the windows. The varied colored reflections filled the church and were breathless to behold. From the door, one sees the rows of pews obviously made from hardwood and a tiled floor. Afar off, the altar looks magnificent with multiple levels reaching up to the ceiling. At a closer look, it was the more beautiful! The six arches of the altar with one at the top displays some saints that I cannot identify. Surmounted on the main altar though is the Jesuits’ emblem and motto “Ad majorem Dei gloriam”. The ceiling above the main altar is likewise beautiful with frescoes portraying the Last Supper; on one side that of the Holy Family and on the other, the Immaculate Conception. 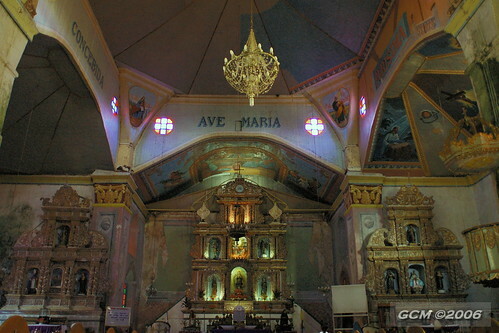 Chandeliers hang at the main altar enhancing the whole retablo. In the nave are two carved benches featuring a goat, a coconut palm, nipa grove and a man. There are also additional paintings of the Ascension, of the Church Fathers, and of San Vicente Ferrer which looks very, very, old. One can notice a pipe organ high up on one side yet people say that it is not anymore functioning and that it dates back to the 19th century. The choir and organ loft though have intricate designs and looks attractive. Beside the church is an old convent which has been converted into a museum. Unfortunately, the museum was closed during our visit and we failed to see the relics and other artifacts greatly mentioned by travelers in their blogs. After a short tour of the church, we went to meet Baby Sagario who was formerly known as Ms. Pequit. Their house is only a few steps away from the back gate of the church; one to two houses away. And boy, I enjoyed my stint there, too. Their house was full of antiques: antique chairs, tables, cabinets, and various little items. They have a phonograph, the old one with the lily-like sound box and it was still functioning. You wind something at its side and it plays. There are also lots of old, rounded, musical disks that still give off heavenly music. But what caught my interest further was the special room of Baby’s mom. It was full of collections: shells of all sizes, shape, and color; books and articles, whatever! Baby’s mother is into everything and all her collections are well arranged and orderly. After a hearty lunch, we have to bid goodbye to Baby and her very accommodating and friendly family. Baby guided us back to the main road but before that, she led us to a “delicatessen” or a bakery situated immediately across a dirt road at the back of the church to buy some “pasalubongs” such as broas, baked polvoron and more. So Baclayon is not only famous for its old church and museum, it also boasts of delicious and tantalizing goodies fit to bring home to our loved ones at home. Viva Baclayon and more power to you!